VLC , one of the best multimedia players these days supporting almost every type of file.I love this player because it even plays files which are not fully downloaded.If the avi file has some problem,it even repairs the avi index also automatically.But when you try to run VLC with Windows Vista , some incompatibility issues may raise with some file extensions.So how to deal with the incompatibility issues ?? Note : Im talking about VLC 0.8.6.b ..You can get it from VlC website. Go to Settings --> preferences in VLC as shown in the figure below. 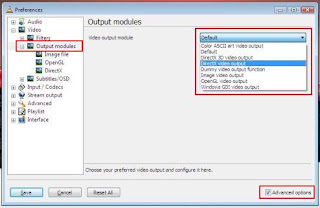 No select the advanced options by checking it.A new option "Video Output Module " will get activated. Now from the drop down menu as shown in the fig , try using either ‘DirectX Video Output‘ or ‘Windows GDI Video Output‘. If the above option don't work for you ,try other options like dummy output video function and all which are in the dropdown menu. Check my other articles on Windows Vista . Originally taken from : How to geek.